Murky He has to get close to you. His low health and your high range makes this hard for murky. Johanna Ignore her in teamfights until you run low on health. 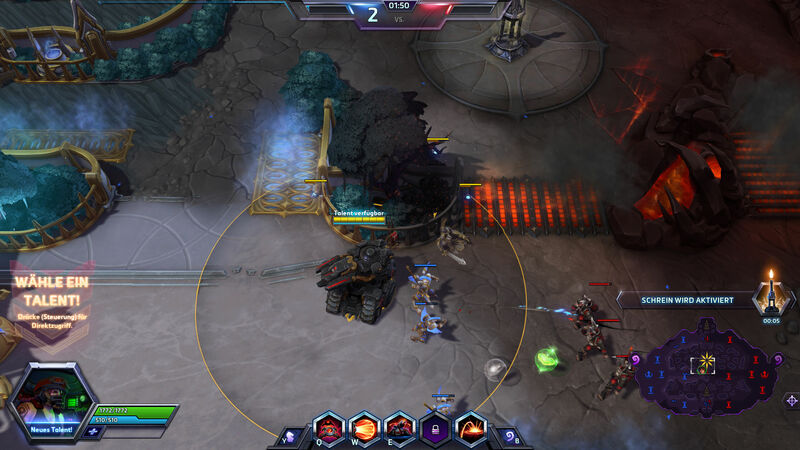 Abathur He likes to place mines below you when you are sieged. 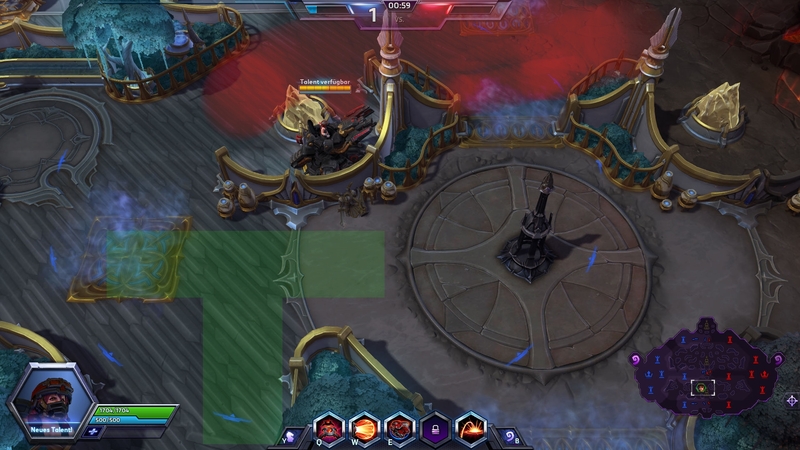 Tyrael Ignore him in teamfights until you run low on health. Zeratul Use your Concussive Blast to reveal him if he sneaks up on you. Jaina You're an easy target for her blizzard if you can't zone her out. Thrall His ult can push your whole team away and leave you vulnerable. Tyrande She can land her stun on you. Artanis Both his ults are effective against you. He will try to use his prism on you. Muradin Ignore him in teamfights until you run low on health. Nova Stay near your team if nova hunts you. E.T.C. He can push you into the enemy team. You can stop him by casting Concussive Blast when he rushes towards you. Needs good timing. Sonya A good sonya will focus you. Diablo He can grabyou into the enemy team. You can stop him by casting Concussive Blast when he rushes towards you. Needs good timing. Falstad He can burst you down and chase you in early-game. In late-game he can reposition you with his ult. This guide aims to new Hammer-players. Sgt. Hammer is a Right-Click heavy ranged specialist and usually deals the most hero and/or structure damage of your team (depending on if you split-push or help capture objectives). Instead of one build that you should always take, hammer has a series of choices for her talents. - 3 mines that proximity activate. They give some vision. You can use them to scout bushes or ganks or to slow down chasing enemys or to defend yourself. In early-game you can place up to 9 mines in one bush and then kite an enemy into that bush to deal 900dmg at level 1. Use mines as often as possible. - Pushes close enemies away. Use it whenever an enemy gets to close to you. This ability can be a life saver. - You loose all mobility and gain more range and damage against minions/structures and splash damage. This is what makes hammer unique. This talent also makes her a sitting duck. You don't have to go into siege mode to fight: Siege mode adds no extra damage against heroes. You can use siege mode to clear minion-waves, destroy structures or when your team tries to secure an objective. It takes a lot of practice to know when and where to siege during teamfights. - This is hammers trait. Bonus damage against distant (about more than half your range away) enemies. This is just another reason why you should ignore a johanna who attacks you and instead focus the squishy enemies who think they are save behind their tanks. - You can use your siege trusters to instantly unsiege and run away. For this reason you should always keep your siege trusters ready during teamfights and not use them to get faster into battle when you are at your fountain. Your siege truster + Concussive blast can get you out of many tight situations and your mines will slow down anyone who tries to chase you. You can also use your siege trusters to chase down a fleeing enemy, but only do this if you are sure, the fleeing enemy is alone and retreat if you couldn't kill him while your siege trusters were active. The heroic abilities are described below at Level 10. Advanced Artillery is always a good choice. The impact of this talent becomes high in the lategame. Ambush is good when you are sure, that you won't be sieged for more than 10 shots, in which case you get more extradamge from this talent. The cloak is not so important. This talent is strong in the earlygame, but gets weaker in the lategame. Resistant A really good reduce of cc. If the enemy team has much stun you can consider taking this talent. However this only works, while sieged. But most of the time you try to avoid incoming stuns and are therefore unsieged. Lethal Blast The only use for Concussive Blast is to push enemys away. Not to deal damage. This talent might give you a better waveclear, but we are not going to use any talents for concussive blast in this build. Regeneration Master Your high range enables you to clear minion waves from a safe distance, while zoning out the enemy when laning. To make use of this talent you have to spend a good amount of time, driving around to collect globes. Since you will miss out many globes this talent is not recommented. Focused Attack adds a high ammount of extradamage to your attacks during teamifights. Take this talent if the enemy team is aggresive or if your team has much cc. Vampiric Assault Hammer has low health and high damage, making this a good talent. Take this if your team has no healer or if you want to split-push. Otherwise we will take the healing talent at level 7. Excessive Force If your team plays well and protects you, you won't need this talent. First Aid can give you enough extraheal to survive a teamfight. When dueling use this talent late (at 30% health left) so your opponent realizes too late, that he should have ran away. During teamfights use this talent early, so you are less likely to get bursted down. Hyper-Cooling Engines This talent graetly increases your mobility and allows you to get out of tight situations during fights more often. The free usage of it in the fountain results in less downtime when calling B. Slowing Mines - Since we mostly use Mines to scout bushes, this talent is rather useless. The other talents at this level are better. Napalm Strike is the heroic of choice. It greatly increases your DPS. You can cast it from a safe distance even when not sieged. Due to its low cooldown you can use it to scout bushes, kill creep, dismount chasing enemies and reveal cloaked enemies. The Napalm Bomb has about 1s of travel time. If you aim close to yourself it impacts immediately. Blunt Force Gun - this heroic has high burst damage but also a high cooldown. If you choose this heroic make sure to choose Orbital BFG at level 20. Overall this heroic is just not as good as Napalm Strike. First Strike adds a huge ammount of damage to your basic attacks. You also deal more damage against structures. You will need a team which can protect you because a single hitpoint damage will reset this talent. Choose this talent if your team has much cc or if the enemy team has no divers. Giant Killer is the safer choice at this level. The bonus damage is less than the bonus damage from First Strike and you get no bonus damage against structures. However if you can stay untouched for more than 5 seconds, you have most likely already won the teamfight, even without First Strike. So it makes more sense to choose this talent instead of First Strike. Barricade can have it's use in tight corridors. You can zone out enemies or trap them. But you won't use Concussive Blast too often with this build. Bullhead Mines - The knockback of the middle mine isn't very usefule. Most enemies will use gap closers to get close to you and will just jump over your mines / avoid them. Graduating Range takes a long time to fully setup. But once you are at max-range you are almost impossible to kill. For the enemys this is a loss-loss. Either they fully engage to stop you, in which case they will run into your team, or they let you slowly destroy their keeps. With the extra-range it will become much easier to not take damage for First Strike. Hover Siege Mode is another popular talent. It gives you a bit mobility while sieged. You can however not shoot while moving and you are moving too slow to avoid AoE attacks. On maps like Infernal Shrines, where you can win by zoning out the enemys from an objective I would highly recommend Graduating Range instead. Executioner This will add even more damage to your auto-attacks if you have some cc in your team. Definitely no bad choice at this level. Mine Field - 5 mines deal about 1050 damage at level 20. You can prepare a trap with this talent by placing 10-15 mines in a bush, but you will miss out the other talents at this tier. Stoneskin - Hammer doesn't have many hitpoints. An extra 30% hp won't help her much. The extra range you will get from Graduating Range usually adds more survivability than Stoneskin. Nexus Frenzy goes extremly well with this build. This is also the most popular talent at this level. Orbital BFG - if you chose Blunt Force Gun you can use this talent to slowly destroy enemy buildings. You can also have two missles on the map at once by firing the BFG while your old missle flys on the map. Advanced Lava Strike gives your heroic an insane range-increase. You can easily deal damage from far away. Fury of the Storm The DPS increase against heroes is lower than Nexus Frenzy. If you want a burst damage build you should choose another hero. In early-game make sure not to push too hard without your Siege trusters ready. Clear minion waves using Siege Mode. When you are going to siege up, make sure that you have enough vision. Either by teammates or by positioning yourself correctly. Below you can see an image of how you shouldn't position yourself. You have no vision in the red area and enemys could sneak up on you and trap you. Your team will stay near the shrine and won't give you vision either. Instead you should siege in the green area. With your high range you can often target all enemy heroes. Focus the squishy enemys (except murky). When you can decide between attacking or defending (For example on the Haunted Mines), attacking is often the better choice. You can use mines to scout bushes. With smart placement you can even scout more than one bush. Below is an example. When duelling against a meele warrior wait until they are slowed by your mines and then knock them back with your concussive blast. You can use concussive blast to save a teammate. When you are sieged and don't have vision on an area you can shoot Napalm Strike in that area. If it hits an enemy you can hit them with your basic attacks 2-3 times. This is probably the strongest map for hammer. Always help to capture objectives and then push with the punisher. Napalm Strike is great to kill the minions at the objective. The minions on the objective give you some protection against Li-Ming. If your team starts chasing enemies, stay at the objective. When the objective spawns near the top lane and you are in the bot lane you can consider split-pushing, as it takes long to get from bot lane to top lane without a mount. If you are going to split-push much, take Vampiric Assault at level 4.